Some guy you don't know talking about books, movies, and other crap that pops into his brain. There’s a scene in Chantal Akerman’s “Les Rendez-Vous d’Anna” where Anna (Aurore Clement) is riding a train to Brussels. She’s standing by the corridor window, just gazing into the distance, watching the lights move by slowly. All at once, a station platform starts zooming past. The phenomenon is called “parallax.” It’s why, when you look out the car window, the roadside ditch seems to be zooming along while the farmhouse in the distance appears to be just creeping by. “Les Rendez-Vous d’Anna” is a brilliant example of a character experiencing life parallax. Anna is a filmmaker, and travels from city to city, hosting premiers, etc. After her first premier, she allows herself to be picked up by a man, whom she takes back to her hotel room. They become naked, and start messing around, but Anna suddenly realizes, “Holy Crap!!! (Merde d’Dieu!!!). This guy looks like a young Jack Nicklaus! GAH!” She tells him to get dressed, but agrees to meet his five year-old daughter the next day–her birthday. She mentions that she could have had a daughter that would be five, and another that would be six, but “the timing wasn’t right.” She meets the man’s daughter and mother, and leaves rather abruptly. Next, Anna’s mother is waiting for her at the Brussels station. They rent a small hotel room, just to grab a few hours sleep before the next train. They discuss old times too, predictably. Then there’s Paris. Anna is picked up by her former lover. They get a room, and the former lover is sick–he has a fever. No nookie this go round for either. Where parallax comes into play is that we see Anna blast through these peoples’ lives, spending a few hours, sometimes less, always on the way to the next stop, but there’s so much more depth. Even with the guy she picked up at the first premier, he is somehow the impetus for Anna to open up about her past. We get our first glimpse of Anna’s past in this first act. The rest of the characters have much more history with Anna. They meet for a few hours, but we are shown the deep, rich history Anna has with these folks. Anna is constantly moving from city to city. The end shot, ironically, is her at home, in her own bed. The primitive answering machine rests upon her nightstand. She flips through the messages, her eyes glazed, almost catatonic as she hears these real voices from real friends, who want to spend time with Today’s Anna, not a ghost Anna who could just as easily be allowed to fall off into history. 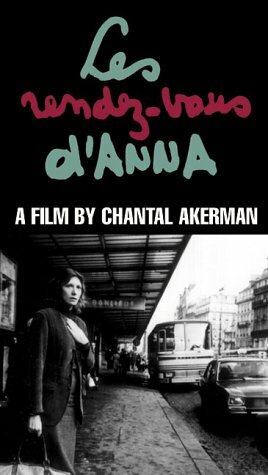 Writer-director Chantal Akerman made a lot of progress in the years between “Je, tu, il, elle” and “Les Rendez-Vous d’Anna.” This film works as a narrative to some extent, but it’s a wonderful character study of Anna. Aurore Clement is an amazing actress. She has a way of looking at the characters with whom she interacts. She is engaging and engaged, not as an actress, but as Anna. Anna is Anna, no matter her company. Although this film is in color–“Je, tu, il, elle” was black & white–the production values are much higher beyond that. Black & white is fine with me, but this film was beautifully photographed, with no shaky hand-held camera work. Also, there is less of the French New Wave influence showing. One thing I noticed about “Les Rendez-Vous d’Anna” was the relative lack of music. There are so many films today with nonstop scoring by Hans Zimmer, Howard Shore, or Danny Elfman–three of my favorites, I should add–that the silence of a woman standing alone on a railway platform is almost disconcerting. There are a few instances of source music–music that appears on screen as part of the film (through a radio or a TV show)–but I can’t recall any separate scoring. It’s a nice touch. If you have trouble with subtitles, or you don’t like slower paced films, you probably won’t like “Les Rendez-Vous d’Anna.” If you can, I recommend you give it a shot. This entry was posted in Films, Films 2012, Foreign and tagged all movies big and small. Bookmark the permalink.